The mid-century sofas have beautiful curved angles. These are normally made of wood and metal and are available in various colors and design. The Brayden Studio Bencomo Sofa will prove to be an elegant yet charming addition to your living room. 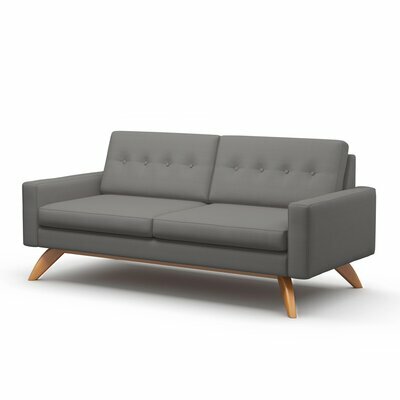 This contemporary style sofa sports hard to miss meticulous cuts and immaculate lines. For unsurpassed strength and endurance, the frame of sofa is crafted from manufactured wood and metal. The sinuous spring system along with foam and synthetic fiber provides you with unmatched comfort. Its recessed armrests are broad enough to rest your arms for while you sit comfortably on the sofa. It stands on sturdy short feet that balance it on the floor. This sofa has multiple seat cushions which are easily removable for hassle-free cleaning. You can also clean it with occasional vacuuming. It is CARB compliant to keep your indoor air quality maintained. Form a complete set for your living or drawing room by pairing this sofa with matching accent chairs. Brayden Studio Bencomo Sofa Collection. Standard design sofa with multiple cushion seat. Built in USA from manufactured wood, metal, synthetic fiber and foam. Sofa frame has dark wood finish. Fabric color: Battleship Lettera Zinc. Available in one more gorgeous fabric color, Pear Spree Indigo. Upholstered in 100% polyester microfiber. Arms, legs and toss pillows included. Includes both seat and back cushions. Back cushions are 26 inches wide. Back cushions are tufted with three buttons. Seat cushions are 26 inches wide with depth of 22 inches. Density of the foam ranges from 1.5-1.8. Removable legs in brown finish. One year limited manufacturer’s warranty for upholstery and cushions. Lifetime warranty for coils and springs. 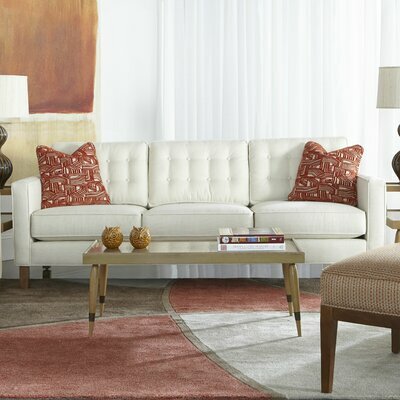 Inspired by mid-century design, Harper Sofa by Wayfair Custom Upholstery is a symbol of style and elegance. It is a beautiful combination of updated silhouette and chic button tufted look that is versatile and fresh. While retaining its tailored feel the dense and high-resiliency foam filled cushion seats give you ultimate comfort. Enjoy a long evening watching your favorite TV shows on this comfortable sofa with five fluffy pillows and cozy seat cushions. Artisan crafted in North Carolina, USA from wood and laminate. Fiber content is 86% polyester and 14% linen. Fabric color: Classic Bleach White. More fabric colors available to choose from. High-resiliency polyurethane foam filled cushions. Upholstery fabric is made from linen. Stylish tapered legs in rich mahogany finish. Seats are attached to the frame with screws and are easily removable. Fluffy back cushions are tufted with eight button tufts. Both seat and back cushions can be removed when required. Comes with 5 pillows including 2 square accent pillows, 2 bolster pillows, and 1 kidney pillow in matching color and same fabric. Product Care: Spot clean the fabric. Bedeck your modern themed living room with the stunning Benchcraft Mulberry Sofa. For immense strength and durability, the frame of this lovely sofa is built from manufactured wood. Part of Mulberry collection, the sofa features woven polyester fabric upholstery that is soft to touch. Its fashionable T-cushion design is worth noticing and gives a modern touch to the sofa. The contrast of Neutral Sand Beige colored upholstery with espresso finished block legs looks charming. Reversible toss pillows with urban script accentuate the sofa while giving you comfort when you rest on this sofa. Sofa frame is crafted from manufactured wood. Assembly is done in USA with global components. Fabric is of lovely Neutral Sand Beige color. Also available in Chocolate colored fabric. Includes seat cushions, back cushions, and four toss pillows. Beautiful toss pillows with urban script on one side and color match on the back side. Sinuous spring seating ensures maximum comfort with long lasting durability. For cushions with excellent resilience, low melt fiber is wrapped over high quality foam. Fashionable and stylish T-cushion design. Sturdy block legs in espresso finish. The aesthetically appealing Mercury Row Tama Convertible Sleeper Sofa will revamp your home interior. Featuring a sturdy wooden frame, this sofa is tough and durable. The stunning sofa is upholstered in faux leather which is easy to maintain. 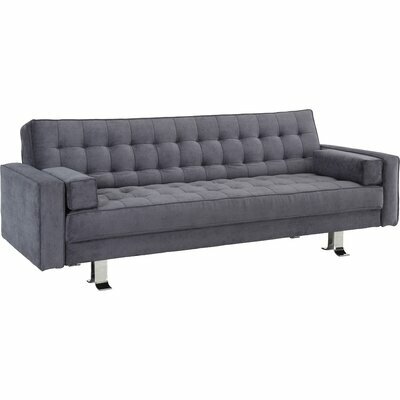 It sports a tufted style, foam filled back and seat cushions that gives you much needed comfort. Its warm charcoal color on graceful yet simple solid pattern boasts a bold look. This convertible sofa reclines back fully to transform in to a cozy bed. This stylish and versatile sofa is a must have in every home. Mercury Row Sleeper Sofa Collection. Built from wood and metal. Sofa frame features dark wood finish. Upholstered in easy-to-maintain microsuede fabric. Tufted for a classy and chic look. Can be used as a lounger or bed. Reclines backward to transform into a bed. Fully reclined with depth of 44.5 inches from front to back. Includes arms, legs, seat cushion and toss pillows. Stainless steel legs in Chrome finish. Requires assembly with the help of Allen key. Apt for both residential and commercial use. Product Care: Spot clean or use a damp cloth to clean. 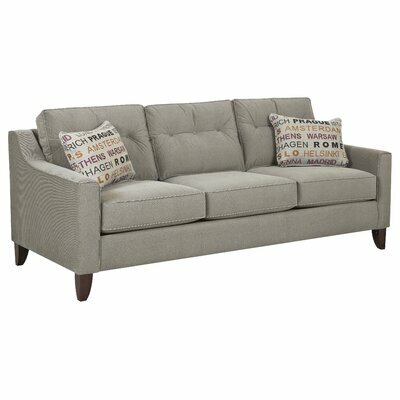 The graceful Abbott Sofa by Rowe Furniture features clean lines and comprehensive cuts. The appealing Abbott Sofa has quintessentially contemporary look with chic and elegant style that blends beautifully with an array of modern home decors. It is crafted from premium-quality materials for longevity and unsurpassed sturdiness. The sinuous spring suspension system and 330 cc foam filled cushions make this sofa very soft and comfortable. 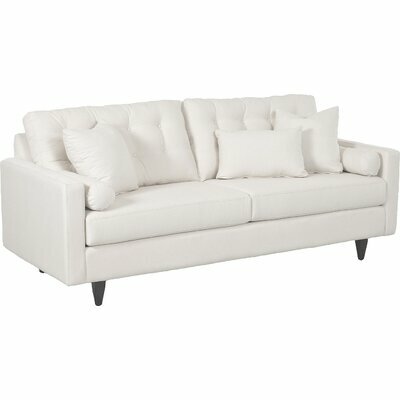 Solid white colored upholstery and button tufted backrest give this sofa an enchanting look. Square-shaped arms for resting your hands and adjustable reclining back ensures that you get unmatched comfort. Durable sinuous spring suspension system ensures comfortable seating experience. Cushions filled with 330 cc foam. Includes arms, legs and two throw pillows. Welted down throw pillows are 18 inches wide. 5 inches high Chrome finished legs. Select from a wide range leg finishes including Chestnut, Chocolate, Espresso, Latte, Pear, Pebble and Washed Pine. Create your favorite lounging spot with the bold and beautiful Saginaw Upholstered Sofa. Its large dual seat cushions and gently sloping curves give it a chic and stylish look. Whether you settle in with a cup of steaming coffee or plop down after a long day’s work, the welcome presence of this sofa will relax your body and mind. 7 button tufts with atomic red colored polyester upholstery exude charming appeal that is hard to miss. The gorgeous Saginaw Upholstered Sofa will bring your living room décor to a center stage by adding depth with its bold style. Solid hardwood construction; built from Rubberwood. Button tufted in linear style for a chic look. Includes seat cushions, back cushion, arms and legs. Six inches high wooden legs. Comes with white plastic glides. Maximum weight limit: 440 Pounds. Manufacturer provides warranty of one year starting from the date of purchase. With its urban flair, the classy Rio Convertible Sofa by Beyan will adorn your living room décor. Thanks to the cotton padded cushions and vinyl upholstery, this luxurious sofa is extremely comfortable. It flaunts an eye-catching orange colored upholstery with unique embossed solid print. Metal frame renders long lasting sturdiness to the sofa. This versatile sofa is convertible and can transform to a plush and cozy bed within minutes. It also comes with a storage compartment below the seat cushion where you can put your less used items and keep your room clutter free. This eco-friendly sofa has minimal effect on the environment. It is a convertible sofa. Sofa frame is made from metal for sturdy construction. Storage chamber under the seat. Includes mattress, toss pillows and legs. Easily transforms into a comfortable bed. Cotton mattress accommodates 1-2 people. Base of the sofa has bold black finish. The seat and back rest features a beautiful orange color. Black colored toss pillows match the base of the sofa. Plastic legs in chrome finish. Sofa requires assembly and it is easy to put together. Add posh sophistication and modern appeal to tour living room with TrueModern Luna Condo Sofa. Ideal for contemporary themed home, this sofa features a modern design with an inspiration from classics Danish design. Thanks to solid wood construction, this long lasting durable sofa can easily withstand external abrasions and wear and tear of time. It is upholstered in charcoal colored easy-to-clean polyester. The seat cushions and their covers are removable that makes it easy for you to clean and maintain this sofa. Its urban look and glossy appearance will add personality to your home. Fusing style and comfort together, the Luna Condo Sofa is a must have. Inspired by classic Danish design. Frame and legs are manufactured in USA from solid wood. More fabric colors available including Chocolate, Dove, Dolphin Grey, Ivory and Mouse Grey. Includes arms, legs, seat cushions and back cushions. Plush seat cushions sit atop sturdy and well-tailored deck. 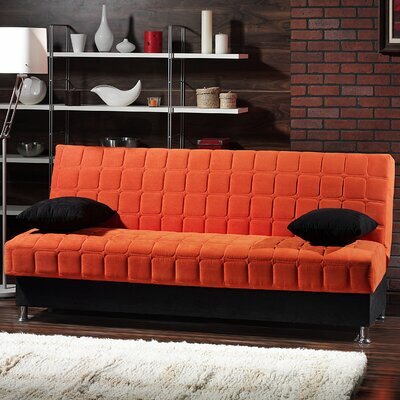 Back cushions are tufted with four button tufts for a retro feel. Legs feature beautiful Natural Honey Alder finish. Stylish legs also come in two more wood finishes including Walnut and Espresso Stained Alder. Comfort and practicality merge in the matchless Kartell Bubble Club Sofa. It is an innovative product that resulted from meticulous research and development. Designed by a French designer, Philippe Starck, the Bubble Club Sofa won Italy’s prestigious design award, Compasso d’Oro in 2001. The Bubble Club Sofa sports a cartoon-like appearance with exaggerated contours of the scrolled armrests. It is a large sofa that can easily fits two people. 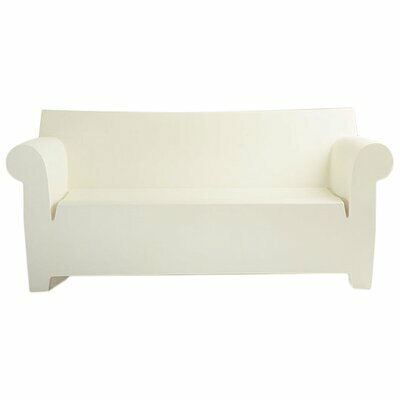 Crafted entirely from plastic, this easy-to-maintain sofa can withstand the wear and tear of time. Apt for industrial and commercial application, it will easily survive indoor and outdoor environment. Designed by a French designer, Philippe Starck. Crafted entirely from smooth batch-dyed polyethylene. It is a two-seater sofa. Available in more colors including Black, Pale Yellow, Siena Red, Pale Grey and Pale Green. Includes arms and legs made of plastic. Very easy to clean and maintain in excellent condition. Best for industrial and commercial use. The Dorel Living Monroe Button Tufted Sofa is a practical fusion of classic look and modern style. This cozy sofa features sturdy construction with thickly padded cushions and springs at the core for additional support and comfort. 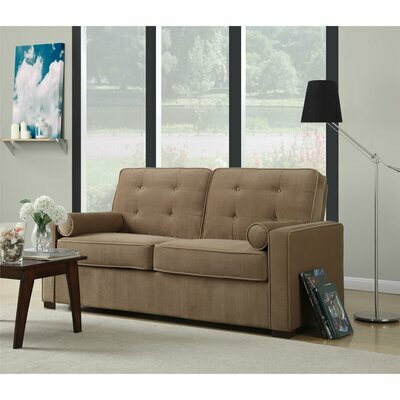 The square silhouette with warm and coffee colored upholstery adds charming appeal to its overall look. Accented with button tufts, welt detailing and soft-to-touch polyester fabric, this stunning sofa will update your living space. Enjoy plopping on this deep, plush seat sofa that also includes two bolster pillows in matching color. Made from sturdy wood and plywood. Upholstery fabric is soft-to-touch polyester/polyester blend. Welt trim detailing across the sofa. Backrest cushions have button tufts. Spring core with foam filled seat cushions for maximum comfort. Includes arms, feet, back cushions, seat cushions and bolster pillows. Features two cushion seat style. 2 side coffee colored bolster pillows with welt tailoring. Sofa rests on solid wood feet.